This week we have an ammonite from the Pierre Shale (Upper Cretaceous, Campanian-Maastrichtian) of southwestern South Dakota. It was collected on a wonderful field expedition in June 2008 with my friend Paul Taylor (The Natural History Museum, London) and my student John Sime. Ammonites are extremely common in this interval, but I like this one because it is broken in such a way to expose its complex internal walls, called septa. We are looking at a cross-section of a coiled ammonite showing an early whorl in the upper left surrounded by a later whorl. The septa are fluted at their margins as they meet the outer wall. The wiggly boundary line between a septum and the outer wall is called a suture. 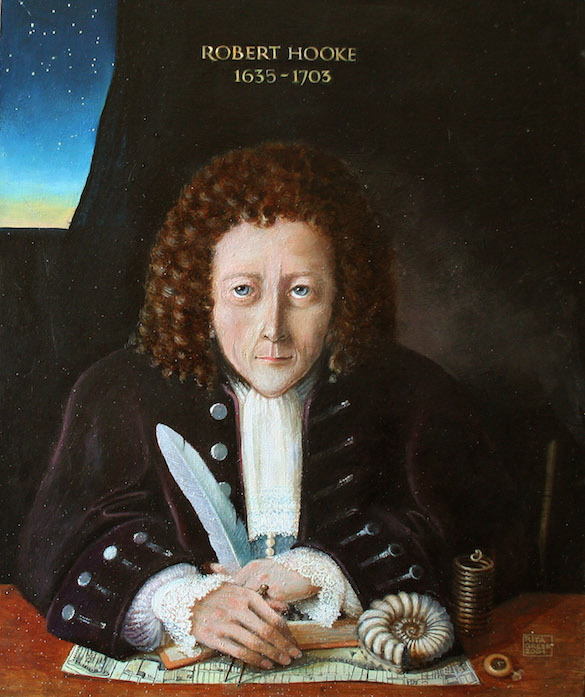 The astonishing English polymath Robert Hooke (1635-1703) took considerable interest in ammonites and their complicated septa. We have no contemporary images of him, but based on descriptions, Rita Greer painted the above portrait in 2004. Hooke’s life was as complex as the suture patterns he studied, so I leave you to other sources on him. Note in the portrait above, though, the ammonite! These are drawings by Robert Hooke of ammonites and their suture patterns (from Kusukawa, 2013). It is a single image mirror-reversed. Beautiful. Derham W. 1726. Philosophical experiments and observations of the late eminent Dr. Robert Hooke, S.R.S. and Geom. Prof. Gresh., and other eminent virtuoso’s in his time. London: Derham. Garcia-Ruiz, J.M., Checa, A. and Rivas, P. 1990. On the origin of ammonite sutures. Paleobiology 16: 349-354. Klug, C. and Hoffmann, R. 2015. Ammonoid septa and sutures. 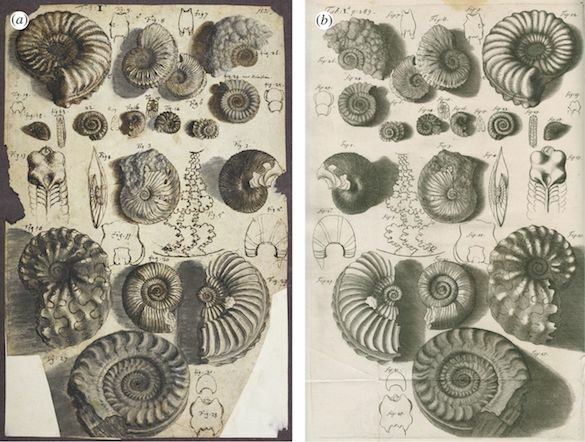 In: Ammonoid Paleobiology: From anatomy to ecology (p. 45-90). Springer Netherlands. Kusukawa, S. 2013. Drawings of fossils by Robert Hooke and Richard Waller. Notes Rec. R. Soc., 67: 123-138. Last year my friend Luis Buatois led a massive project to review essentially all trace fossil invertebrate ichnogenera (523!) to place them in a series architectural design categories (79). This is a new way to assess patterns of ichnodisparity (variability in morphology of trace fossils). I was proud to have a role in this work, along with Max Wisshak and Gabriela Mángano. The paper has now appeared in Earth-Science Reviews (Buatois et al., 2017). My contributions were mostly with the bioerosion traces (along with Max), so I show Figure 65 from the paper above. Its caption: Examples of pouch borings (Category 65). A: Petroxestes pera, Ordovician, Whitewater Formation, Ohio, USA. B: Rogerella isp. 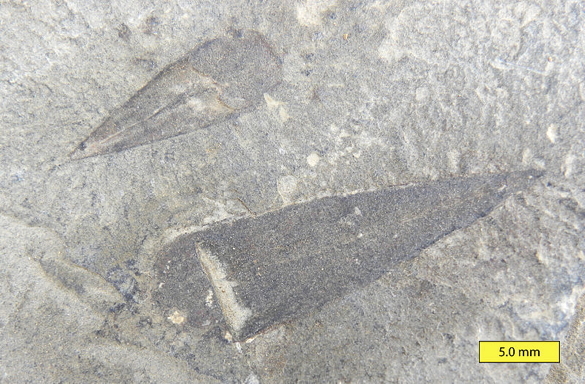 in a belemnite rostrum. Jurassic, Spain. C: SEM of Rogerella isp. in an epoxy resin cast of an Echinocorys echinoid test. Upper Cretaceous, Palm Bay, Thanet, Kent, UK. D: Umbichnus inopinatus in a bivalve shell. 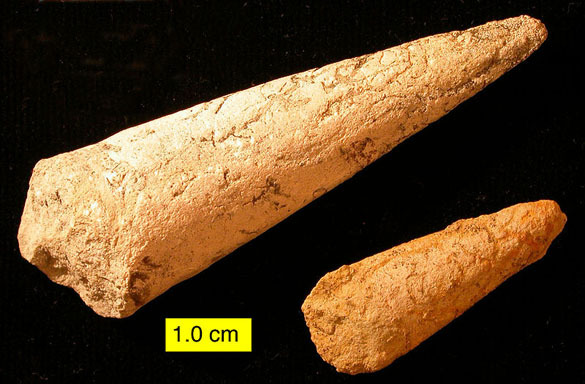 Lower Pliocene, Huelva, Spain. Photograph courtesy of Jordi Martinell. E: SEM of Aurimorpha varia in an epoxy resin cast, including the holotype in the upper right. 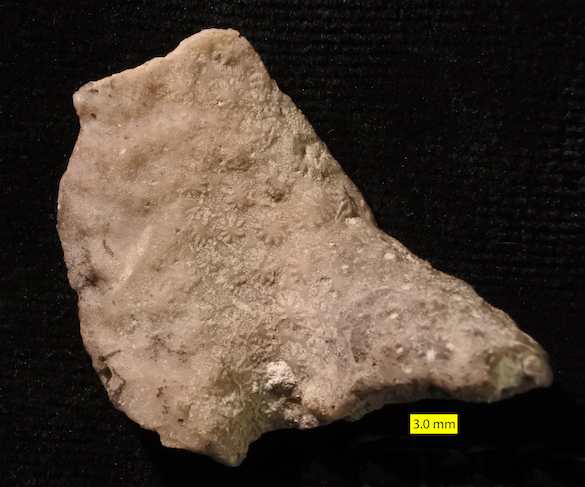 Middle Pennsylvanian, Desmoinesian, Boggy Formation, Buckhorn Asphalt Quarry, Oklahoma, USA. The abstract of the paper explains the work and our ambitions for it: Ichnodisparity has been recently introduced as a concept to assess the variability of morphologic plans in biogenic structures, revealing major innovations in body plan, locomotory system and/or behavioral program. Whereas ichnodiversity is measured in terms of the number of ichnotaxa (i.e. ichnogenera or ichnospecies), ichnodisparity is evaluated based on the identification of categories of architectural design. Seventy-nine categories of architectural designs (58 for bioturbation structures and 21 for bioerosion structures), encompassing 523 ichnogenera (417 for bioturbation structures and 106 for bioerosion structures), are defined. They are restricted to invertebrate ichnotaxa, whereas vertebrate trace fossils were not included. Although the scheme is designed to be comprehensive, the proposed categories are necessarily works in progress because of the state of flux in ichnotaxonomy and the need to adjust the definitions of categories according to the scope and scale of the analysis. Although it may be said that the establishment of categories of architectural design is to a certain degree a subjective enterprise, this is not different from ichnotaxonomy because classifying trace fossils from a taxonomic perspective implies observing the morphology of the trace and interpreting it in terms of behavior. The concept of ichnodisparity is free of some of the vagaries involved in ichnotaxonomy. The fact that ichnodiversity and ichnodisparity exhibit different trajectories during the Phanerozoic underscores the importance of adding the latter to the ichnologic toolkit. Figure 80 above contrasts ichnodisparity and ichnodiversity. The five different ichnogenera illustrated in the upper portion of the diagram represent minor variations of the same architectural design. The lower portion of the diagram represents the same ichnodiversity level, but with a much higher ichnodisparity. The two hypothetical situations bear different implications regarding the extent of evolutionary innovations. We hope that this work is long useful in paleontology, especially for projects sorting out the evolution of invertebrate communities. Buatois, L., Wisshak, M., Wilson, M.A. and Mángano, G. 2017. 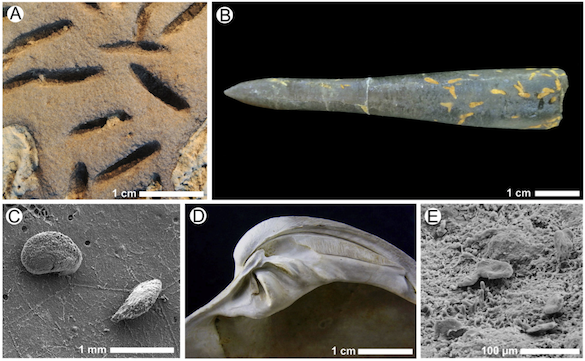 Categories of architectural designs in trace fossils: A measure of ichnodisparity. Earth-Science Reviews 164: 102-181. Last semester the Invertebrate Paleontology class at Wooster had its annual field trip into the Upper Ordovician of southern Ohio. We had a great, if a bit muddy, time collecting fossils for each student’s semester-long project preparing, identifying, and interpreting their specimens. Like all research, especially when it starts in the field, there were discoveries and surprises. 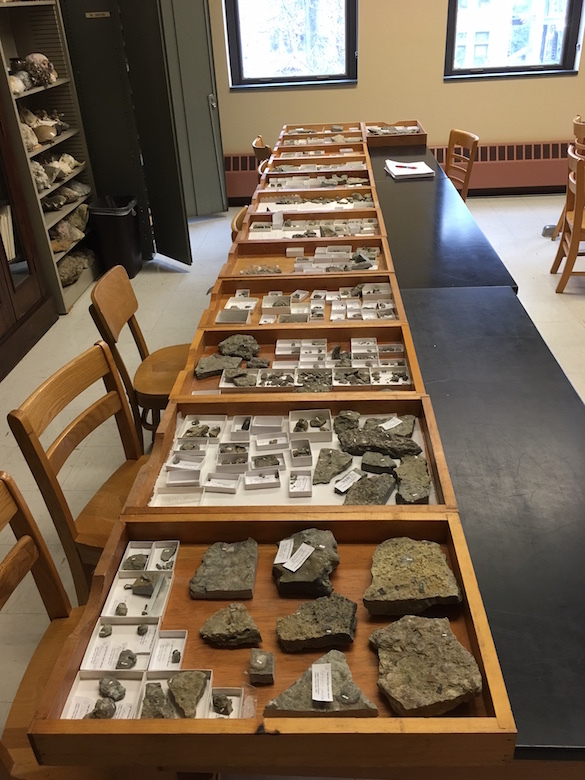 I always highlight a particular specimen collecting by a student in this blog. Above is a cross-section of a specimen found by Tommy Peterson (’19). It is the rhynchonellid brachiopod Hiscobeccus capax almost completely enveloped by an encrusting trepostome bryozoan. 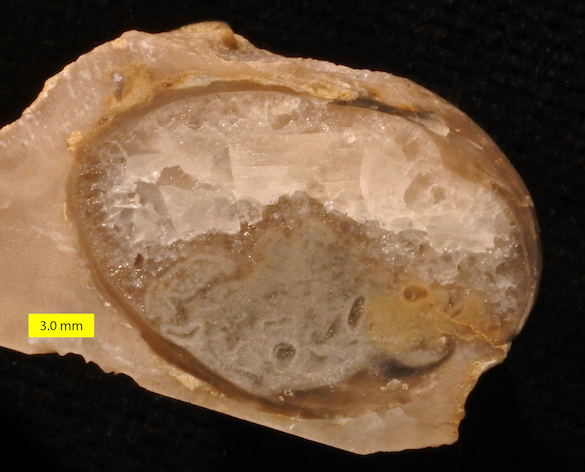 We’ve cut through the center of the brachiopod, revealing gray micritic sediment and clear calcite crystals. We can infer from this simple specimen that the brachiopod died and its shell remained articulated. Sediment drifted in, filling the bottom half of the shell. The bryozoan eventually sealed it all up as it used the brachiopod shell for a hard substrate on a muddy seafloor. The remaining void space was filled in by the precipitation of calcite crystals. You can see that the crystals nucleated from the outer margin of the cavity and grew inwards, a kind of calcareous geode. I’m intrigued by the irregular sediment surface and the manner in which calcite nucleated upwards from it. I suspect this sediment was itself cemented before the calcite crystals appeared. This kind of structure is called a geopetal. It shows the “way up” at the time of crystal formation. 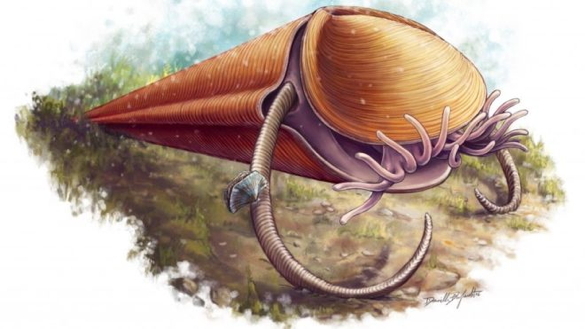 Gravity held the pocket of sediment in the bottom of the shell, leaving the void at the top. Nice little specimen. 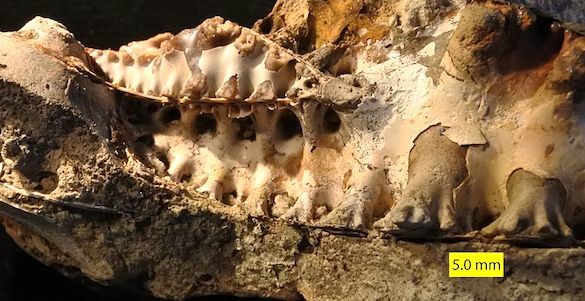 This star-studded bryozoan found by Alexis Lanier (’20) was going to be the Fossil of the Week, but then I saw that last year I highlighted the very same species! I think the bryozoan Constellaria is cool. Read all about it and its history at the link. 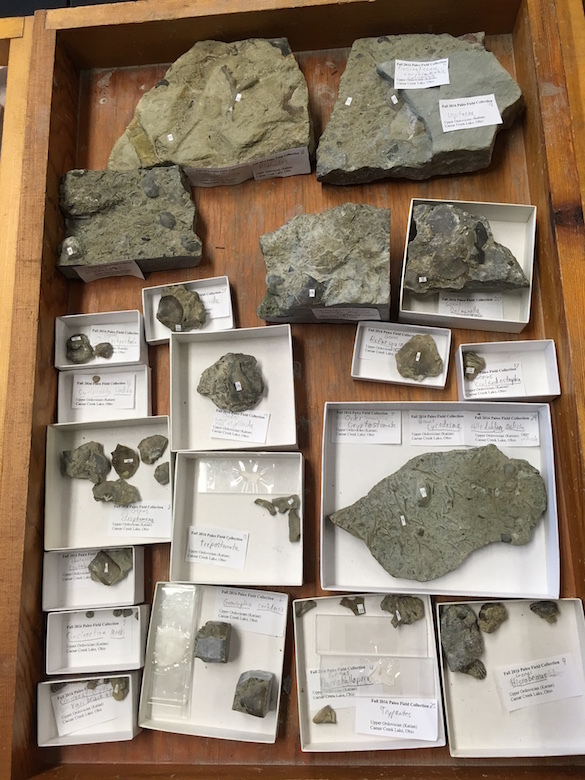 Here are the completed specimen trays for half the class. (Grading this project took, as you might imagine, considerable time!). Every week in lab, after we had done the assigned work, we got out the trays and cleaned, prepared, and identified the specimens. Students learned how to use the rock saws and make acetate peels of the bryozoans and corals. Inside a typical tray. We are very grateful for the many online sources to aid identification of these Cincinnatian fossils. Three in particular were most valuable: Alycia Stigall’s Digital Atlas of Ordovician Life, Steve Holland’s stratigraphic and paleontological guide to the Cincinnatian, and the spectacular Dry Dredgers website. Ohio is a paleontological paradise!